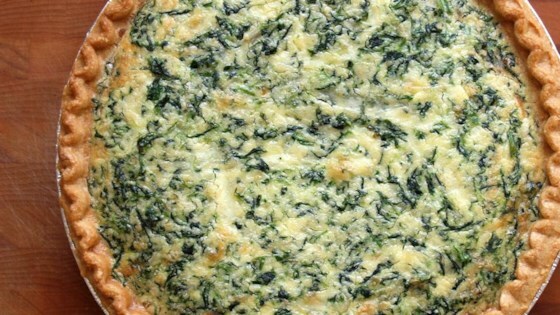 "This quiche is so delicious and easy to make in addition to being budget friendly. We never have leftovers, even with several picky eaters in the house!" Line two 9-inch pie plates with crusts. Cover crusts with a double layer of aluminum foil and a layer of pie weights or dried beans. Bake in the preheated oven until edge of crust is golden, about 10 minutes. Carefully remove the foil and weights; continue baking until the crust sets, about 5 minutes more. Let crusts cool briefly. Reduce oven temperature to 350 degrees F (175 degrees C). Sprinkle cheese, spinach, and onion evenly onto the crusts. Whisk eggs, milk, salt, and pepper together and divide evenly between the crusts. Bake in the center of the preheated oven until golden brown and firm in the centers, about 45 minutes. Use cream instead of milk for a special treat!